Her you will find the typical Indification Metal Tags "Dog tags"
of the US Military, personalized with your data or clear without letters. Dog tags There are 3 products. 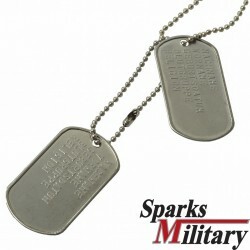 US MilitaryIdentification tags set (dog tags)Set includes 2 Dogtags and 2 chainwe produce original dog tags "Dog tags" with your personal data. 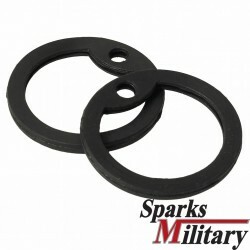 The brands as well as the machine are from US army stocks. Please fill the fields at the bottom of the page! 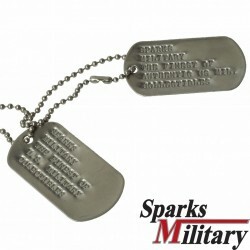 US MilitaryDog Tags (Identification Tags)Upon request, we produce original "Dog tags" with your personal data. (The tags as well as the machine are from US army stocks) Please fill your lettering in the fields below!